One medium peach contains 60 calories and 2 g of dietary fiber. Peaches are also good sources of vitamins A, C, K and the B complex vitamins as well as minerals like potassium. The vitamin A in peaches is beneficial for maintaining healthy skin. The vitamin A in peaches helps keep the linings of the digestive and respiratory tract healthy. 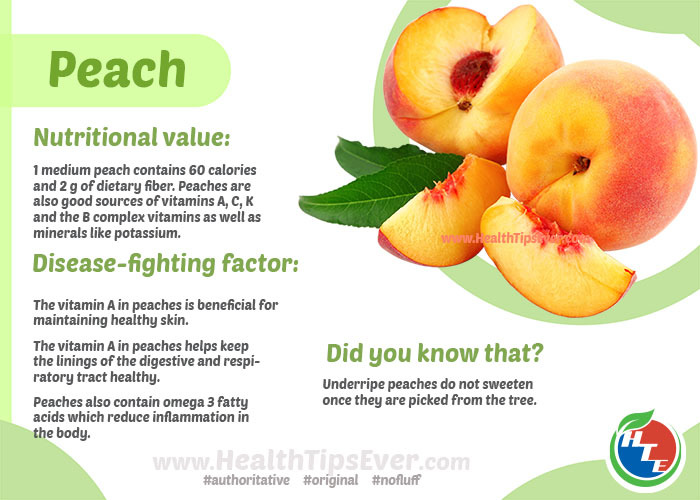 Peaches also contain omega 3 fatty acids which reduce inflammation in the body. Underripen peaches do not sweeten once they are picked from the tree.